World leader patented waterless biodiesel processors. At its core, ISM is committed to addressing the world’s environmental and socio-economic issues with biodiesel production technology. ISM has lines of equipment in operation or under construction on four continents. Some of our European facilities have been in operation for over six years. Our expertise in bringing biodiesel facilities into production is almost unmatched in the industry, and we do it efficiently, quickly and with the full cooperation of our clients. From our 3.500 TPY factory to our latest 68.000 TPY, we have always challenged existing technologies and assumptions. To overcome water contamination issues, we have developed a completely waterless system. To reduce construction times we designed modular systems that could be trucked to any site and installed in no time. Our fully automated lines allow our plants to run continuously, 350 days a year with no downtime for maintenance. Built offsite and installed under our supervision while our training team prepares your operating team to better understand their responsibilities through hands on, direct interaction with all the key components as they are installed. Pipe to pipe processor and ancillaries or comprehensive turnkey factory with rail yards, storage tanks and trucking racks, we provide the highest quality and most comprehensive solution to your production needs. We have full-time, traveling, sales support technicians ready to respond to any situation that may arise. We handle feedstock problems, analyze methanol impurities, provide solutions for glycerin offtake and work with local town councils. Our support goes beyond technical assistance to responses to personnel requirements and identifying new feedstock sources. Our job is to get the plant built, and to keep it running. A full range of biodiesel production solutions, the ISM PROCESSORS are available as pipe-to-pipe processing platforms or as part of a fully-built, turnkey production facility, both of which are supported by complete installation, start-up and transitional	assistance, including a five-day training curriculum and proficiency testing with a certified technician. The heart of a completed production facility, the pipe-to-pipe platform is comprised of 10-12 skid-mounted modules that include the feedstock input pipe, the transesterification reaction and separation modules, the methanol recovery system, the waterless product polishing system, the final filtration system, the oil drying module and the dosing module. All of these systems are connected by piping, valves and sensors that lead to the output. The turnkey production facilities include the pipe-to-pipe platform along with site development, which includes surveying, permitting and construction of the buildings, tank storage farm and loading/unloading capabilities. The popular biodiesel production units are guaranteed to produce EN14214, IS 15607, ASTM D6751-compliant biodiesel from any vegetable oil or animal fats . Production rates range from three million gallons to 100 million gallons per year (operating 24/7/350). 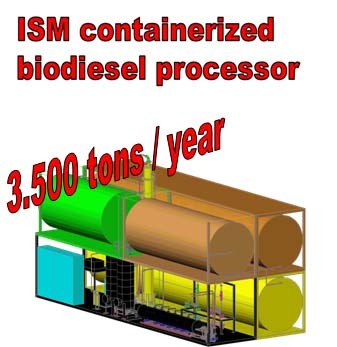 With more than 20 processing lines under contract in all around the world, ISM has more working installations of modular biodiesel solutions than any other company in the world. We make biodiesel fuel production affordable and feasible for operators of all sizes. Our customers are located around the world and range from fuel distributors, farm co-ops, terminaling operations to full-scale industrial plants. ISM to develop the first truly waterless wash system. ISM's unique waterless technology is extremely well suited for areas of the world where there is acute competition between agriculture and other uses for scarce water resources. This includes arid regions of the Americas, Europe and Asia, especially in those countries where there is a difficult balance between uses of resources for food production versus fuel production. Deployable in almost any environment, ISM's modular design allows a small footprint, rapid deployment and the ultimate in flexibility. ISM's dedicated fabrication factories in the U.S., India and Europe fabricate the modules on assembly lines, ensuring consistent quality and cost-efficiencies. The modules are delivered to your site assembled-saving you money and time. Capacity can be increased easily by adding additional Processing Line Modules-your biodiesel production capacity can increase as your business grows-ensuring future expansion at a lower capital cost. Providing maximum flexibility, the ISM processors is able to process a wide range of feedstock with an acid value of 5 or less-or, with our High FFA processor, an FFA up to 30%. ISM's patented process eliminates acid and water, allowing ease of processing and permitting and improved yield. The process produces only two output streams: transesterification and pure FFA, the latter of which can be sold for additional revenue. Touch screen computer control of all system components is standard on all ISM biodiesel processing plants. Operators and managers have a fast and reliable way to control the system with real time monitoring of all valves, pumps, pressures, temperatures, flow speeds and processes. The entire system can be monitored or controlled remotely via the internet.